The project consisted of the replacement of the existing timber and steel one-lane bridge on Retrac Way over Wolf Creek. 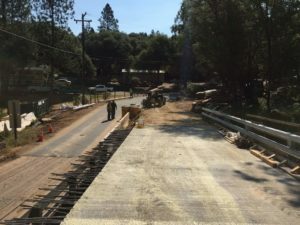 The existing bridge did not meet current County or California Department of Transportation (Caltrans) design standards for structural components and load carrying capacity. 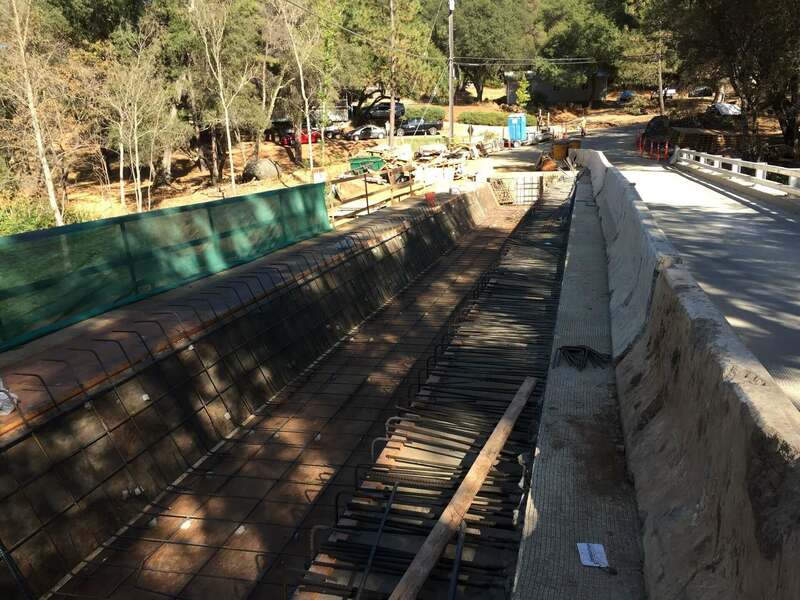 The new structure is a two-lane, pre-stressed concrete box girder bridge measuring 31’-4” feet wide and 99’-0” feet long. 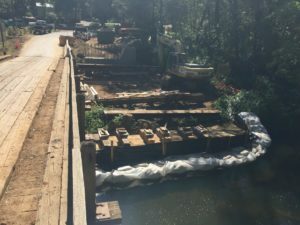 It is located on the same alignment as the existing bridge and elevated approximately 2 to 3 feet above the existing grade to better accommodate 100-year flood event(s). Additional work required for this project included Retaining Wall construction, temporary shoring, a creek diversion and dewatering, 24” CIDH piles, paving, drainage system construction, California ST-30 Bridge Rail and striping. The project was to be constructed in 2 seasons where Stage 1 was to build the South side of the bridge while the existing bridge remained in place and Stage 2 was to demolish the existing bridge and construct the North side of the bridge. Our goal was to accelerate the work and complete the entire project in one season. We knew that it was going to be a tight schedule in order to get out of the creek by the October 15th deadline. Work began on March 27th, 2017 with biological monitoring and construction began on April 3rd with shoring installation. 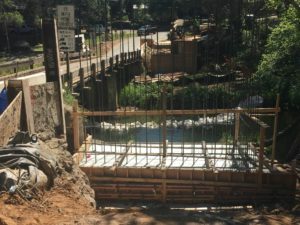 Our first challenge was installing the shoring for Abutment 1 because we encountered a large boulder 6-feet higher than the boring logs indicated. 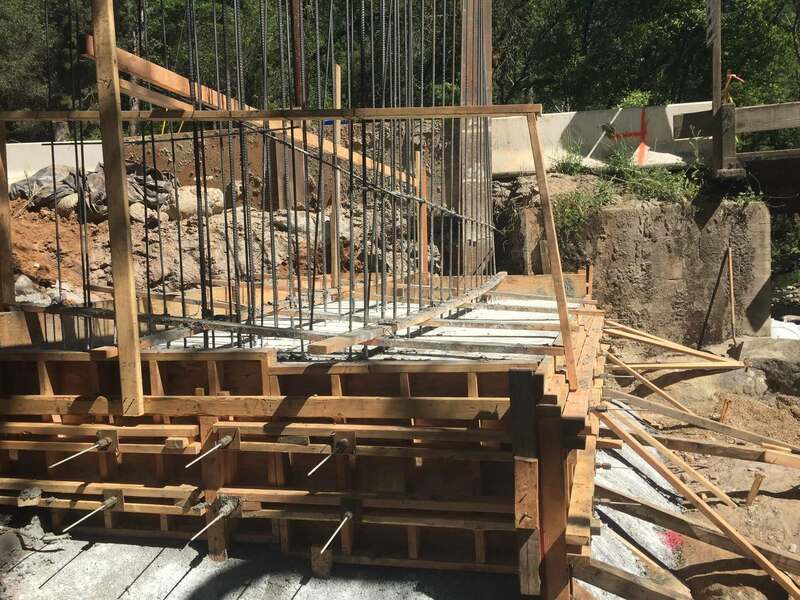 This set the project back one month because of the additional effort required to drill through the boulder for the shoring. Once the shoring was installed, we were able to complete Stage 1 by the end of July 2017. 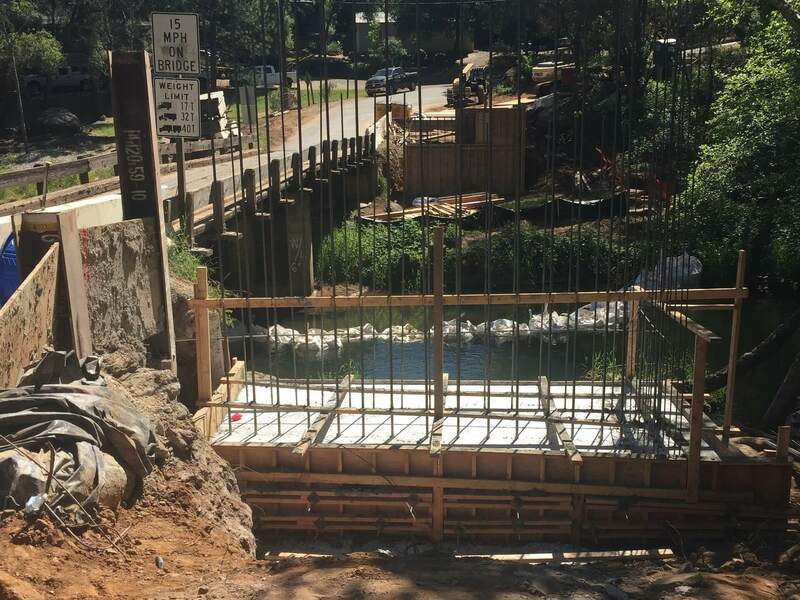 We then switched traffic to the Stage 1 bridge, demolished the existing bridge, and began construction on Stage 2. We encountered the same boulder in Stage 2 at Abutment 1 which delayed the project another week due to the removal efforts. We also encountered delays at Abutment 2 while drilling the piles because of another boulder. 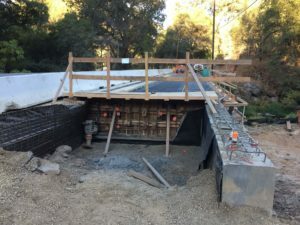 The delays set the project back another 5 weeks, however; we were able to overcome these delays to finish construction of Stage 2 and make it out of the creek by November 1st after being granted a 2 -week extension from October 15th and accelerating the work.